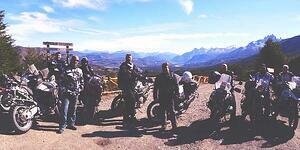 Contact Us About Your Motorcycle or 4x4 Adventure Travel Wishes! Fill out the form to the right and let us know what your next great motorcycle or 4x4 adventure should be like! Sometimes these decisions require some local expertise on the various packages we offer, so part of our service is to understand what would make YOUR perfect adventure, and advise accordingly. Save yourself the time of looking around and researching about seasonality, riding conditions, weather trends, etc. We can advise you on the right place to go based on your timing needs. RIDE Adventures Staff has done all the route planning for you through months and years of riding research in the areas shown. Rest assured, that means you'll be seeing the absolute highlight reels of each area!